The setup of Convex’s main screen is revolutionary—both literally and figuratively. Like something akin to Wheel of Fortune, all the categories (of which you can rearrange under Preferences) are placed on a spinning wheel. Flick or scroll through the wheel until the desired conversion type shows up on the bottom; tapping on a specific section of the wheel also works (and is faster, but only if you’ve memorized the icons and what they stand for). Tapping the text or the selected section will take you to the corresponding conversion page. Here, you can futz around with the graphic on the lower half of the screen. As you move your finger around, the values above will change accordingly, as will the graphic and the indicators’ positions on the scales found on either side of the screen. Usually, though, you do have a specific number in mind to change. 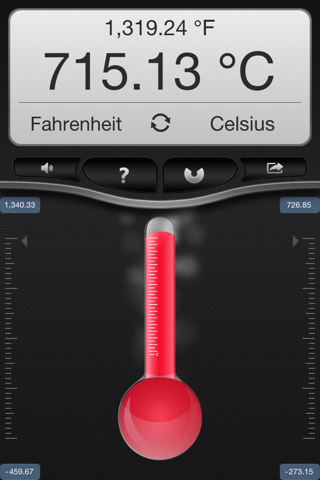 Tap on the number value to open up a bar above, where you can type in numbers and units. Oddly, you aren’t constricted to units under the specific category: you can type in any units and Convex will pull up the conversion for you, provided that the units match. For example, you could type “50 ft to cm” and the app will automatically take you to the Length category, even if you were in Power. Switching units around is a matter of tapping the circling arrows between the unit types. Once you’ve gotten your conversion, you can copy it to the clipboard or send it as an email by tapping on the forwarding arrow beneath the unit types (fourth button). Also to be found on this row of buttons are the volume button (first) and “back to Menu” button (third). The volume button was one that I used quite frequently, as every touch or animation happening in this app is accompanied by a noise or sound effect. This gets old very very fast, especially if the sound is on a loop. The help button was also utilized often in the beginning, but you should be fine once you know your way around the app. There’s no denying that Convex is spiffy though it looks a lot like Convertbot. The developers have managed to take a staid activity and craft it a new, fun shell. As great as this app is, however, I would venture that the usual, boringly straightforward conversion apps are probably still relevant. The whole “just type it” approach–which reminds me of converting through Google search, something that I use often–renders the rest of Convex kind of redundant. Who needs to choose a category when you’ll be taken straight to it just by inputting it in anyway? Playing with the animations is exciting for the initial launch, but when you just want a conversion, you’re not really going to play around with all the extra doodads that will screw up the values (which I found annoying: one brush up against the graphics and your conversion has to be done all over again). Convex is impressive and shiny, but I think I’ll stick with Google/my old conversion apps all the same. 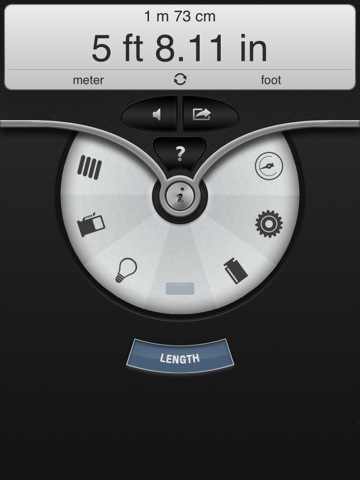 AppSafari review of Convex was written by Julie Guan on August 10th, 2011 and categorized under App Store, Calculators, Reference, Utilities. Page viewed 4244 times, 1 so far today. Need help on using these apps? Please read the Help Page.